We value and respect your loyalty. Each time you travel with Max Holidays you earn loyalty rewards, which you can redeem for your next trip with us or even can offer to one of your friends as a gift. Our rewards are much more than a cup of coffee at a local restaurant, a meal for two or a free night stay in a good hotel. When you book a tour package with Max Holidays (for a minimum duration of 07 nights or more) you get entitled for a coupon offering you upto 5% discount / cash back of total value of your current land trip for your next tour package booking with us for a similar or longer duration within next 3 years. This discount coupon is also transferable to your friend willing to book a trip with us. When you have booked tour package with us on three (or more) occasions within a time frame of three years, you get entitled for a discount coupon offering upto 10% discount on land arrangements on your next tour package purchase with us within next two years time. 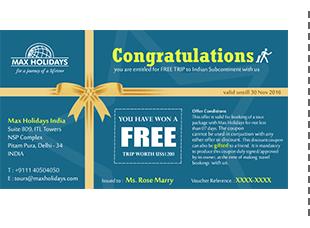 This is a non-transferable scheme applicable only for our legendary clients who love our services and always chose us for their holidays. If you have travelled on a tour package (for 7 or more nights) on more than 05 occasions in last three years, we reward your loyalty, by offering upto 50% discount on land bookings for your sixth tour package booking with us. 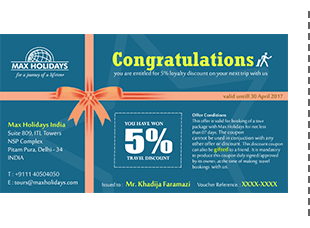 This is a non-transferable coupon for our legendry clients who have made us feel proud by selecting us on every occasion they travelled. 3. The discount will only be applied to the cost of land bookings of the tour. Air fares, train fare, tickets, tips etc are not covered in discount scheme. 4. Loyalty discounts cannot be applied to pre or post tour hotel costs, insurance, flight supplements, single supplements or local activity costs deemed as extra. 5. Such discounts cannot be used in conjunction with any other offer or any other discount extended to the client by our team during the course of correspondence. 6. The Loyalty Rewards are offered at the discretion of Max Holidays and we retain the right to terminate such discounts or to change the discount rules, regulations, conditions of participation levels, in whole or part, at any time, with or without notice, even though these changes may affect the value of the discount already accumulated. 7. The new loyalty discounts will be live from 10th December’2015 onwards and cannot be backdated.